Where games of chance are concerned, Canterbury Park is, naturally, most often associated with horse racing. 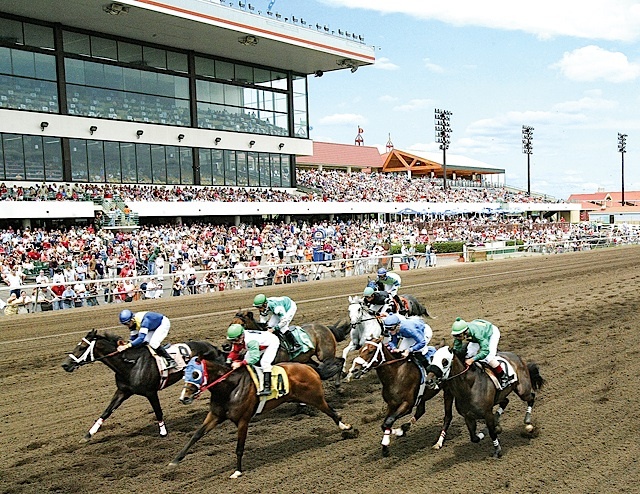 From early May to Labor Day, Canterbury Park runs a meet that consists of 69 racing days, generally holding scheduled races Thursday through Sunday, with racing added on several holidays throughout the meet. If you prefer to win or lose money under your own steam, card games are available, often presented in the form of tournaments: $50 New Player Bonus, Overnight Quads, $100 No Limit Hold’em, and $35 No Limit Hold’em, just to name a few. Bar and restaurant options likewise abound: Triple Crown Buffet, Triple Crown Restaurant, Home Stretch, and The Finish Line Cafe are but a few of your choices. A free trolley connects Canterbury Park to Mystic Lake Casino’s Hotel. Mystic Lake’s games include slot machines, blackjack, bingo, cosmic bingo, and pull tabs, all contained within 150,000 square feet of space. A 600-room hotel and spa are available for your sleeping and soaking pleasures, as well as an adjacent 122-space RV park. Mystic Lake’s complimentary shuttle services stop at more than 50 stops throughout Minnesota. Mystic Lake is home to seven restaurants, three bars, and even a coffee shop. For those who prefer to do their gambling while wearing ugly, checkered pants, golfing can be had at The Meadow at Mystic Lake course that sports 80 bunkers and 13 holes; Dakotah! Sports & Fitness Center is a parallel option, hopefully sans ugly pants. This summer, the Mystic Showroom will provide a stage for such diverse marquee acts as Tony Bennett, Led Zeppelin 2, and Lionel Richie. 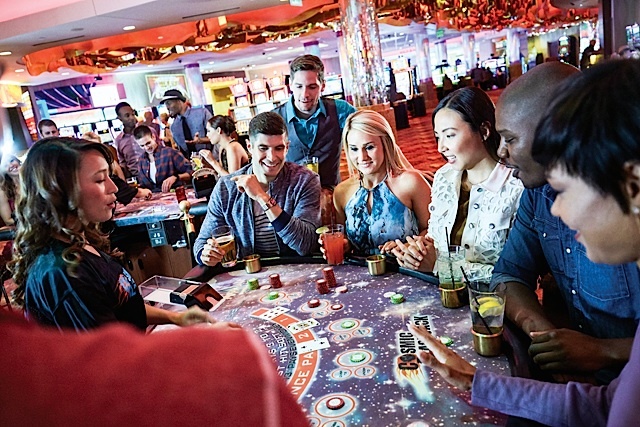 Designed to mimic its Las Vegas counterparts, Running Aces Casino & Racetrack’s card room features such games as Mississippi Stud, Fortune Pai Gow, 3- & 4-Card Poker, Texas Hold’em, and more. Bingo and carnival games are also possibilities, but such contests represent only half of the equation. Running Aces’ summertime schedule obviously includes harness horse racing. And if you’re the type of gambler who likes to catch his own dinner before eating it, you’re in luck: an on-site pond affords takers the Trout Air Experience, where you catch a live fish which can even be cleaned and cooked for you, just like the pioneers of old, except for the cleaning and cooking part. In terms of entertainment, Running Aces offers monthly comedy shows, outdoor concerts, and various events throughout the year. And like the casinos of Vegas, Running Aces is open 24 hours a day, seven days a week. The only casino resort in southern Minnesota located on the Mississippi River, Treasure Island’s gaming contingencies include slot machines, blackjack, keno, poker, pull tabs, video roulette, live dealer blackjack, and island bingo. If playing in someone else’s ugly shoes is your thing, a 24-lane bowling center is at your disposal. After that emotional purge, you can recharge within the sanctuary of a hotel room. Or, if you prefer to sleep within your transport, you can do so at the RV park, and if you really want to work Treasure Island’s island motif, you can take advantage of the marina located just one mile north of the casino. This summer, the Island Event Center will serve as a showcase for acts as varied as Olivia Newton-John, Chicago, Weezer, and Willie Nelson, among many others. Other summer-centric outlets include a water park and spa. St. Croix Casino Turtle Lakes boasts “a thousand ways to play,” and that’s not much of an exaggeration. Some of the ways to play are blackjack, craps, roulette, slot machines, and poker, as manifested in either tournaments and showdowns. Turning your playing adventures into a weekend getaway is an option thanks to the St. Croix Casino Turtle Lake Hotel, located about a block and a half west of the casino proper, and true road warriors can hang their hubcaps at the adjoining RV park. Dining and drinking options vary from Florsheimed to flip-flopped, those options including the TLC Buffet, a concession stand, Me-Ki-Noc Restaurant, and Craft Beer Bar in the Lodge. The St. Croix Casino Turtle Lake Event Center will, in the coming months, showcase its own version of a thousand ways to play, as demonstrated by visiting rock bands, blues bands, metal bands, country bands, and tribute bands. 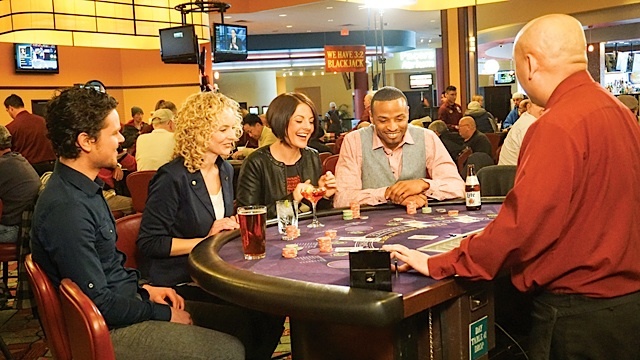 At the Grand Casino Hinckley, you can take your chances with pull tabs, bingo, poker, blackjack, and slot machines. A grand hotel is part of the establishment, as is an RV resort. Within this camper jungle, available for rentals are a series of chalets (which loosely translates from French into Minnesotan as “fancy up Nort’ cabin”). As far as eats go, Grand Casino Hinckley prides itself on offering “a taste for every occasion,” and they’ve got the restaurants to back that offer up. Stories Diner, Silver Sevens, 411 Craft Bar, among many others, are there for your taste buds’ edification. This summer, the amphitheater and the Events & Convention Center will provide a forum for, along with others, Alice Cooper, KISS, and Rascal Flatts. Like its sister establishment, Grand Casino Mille Lacs offers pull tabs, bingo, poker, blackjack, and slot machines for your thrill-seeking pleasure. Its most distinctive, distinguishing physical trait is the brand new Brand Burger Bar, a sprawling eat house that Grand Casino Mille Lacs describes as “an ode to sports fans where guests can place their favorite burger order and settle in for a fun, community-based viewing of their favorite sports events.” Bar-style seats are accentuated by nearly 40 big screen television sets. Other omnivorous possibilities include Grand Buffet Mille Lacs and Plums. Grand Casino Mille Lac’s Events & Convention Center is Mille Lacs’ only performance venue, and this summer’s acts include the Commodores, Rod Stewart, and that old, casino stalwart, Kenny Rogers. Within certain Native traditions, bears are symbols of good fortune, and Black Bear Casino tries to bring that notion to life. Slot machines, poker, blackjack, and bingo are offered for your fortune-seeking pleasure. Tired gamblers can hibernate in one of 408 cubby holes found at its first-class hotel. Some amenities are a 32-inch flat screen television set, free high-speed internet access, as well as access to a world-class pool and arcade. And when you get hungry, you won’t have to tear apart a bee hive, you can bring your empty tummy to the Seven Fires Steakhouse, The Buffet at the Bear, the Sage Deli, the Black Bear Coffee Shop, or the Cobalt Nightclub and Cabaret. This summer, Otter Creek Event Center will present diversions as divergent as Australian sap specialists Air Supply, country artist Martina McBride, and MMA cage fighting. Northern Lights Casino provides slot machines, blackjack, and poker for your gambling pleasure. A free shuttle is available to people who join the Players Club which also allows gamblers to earn redeemable points while they play. For the wagering foodie, NorthStar Buffet is described as “a celebration of savory delights served fresh every day.” The buffet is distinguished not by its “all you can eat” promise, but by its “all you can imagine” promise. Dancing Fire Restaurant offers expertly prepared selections including prime steaks, seafood, and more in a distinctively intimate setting. For smaller appetites, Little Star Snack Bar (“fast, fresh, and always delicious”), is the perfect place to turn hard luck into warm comfort. Northern Lights Casino’s Event Center will be a crazy quilt of summer entertainment, featuring Flo Rida, Biz Markie, Rob Base, and DJ Kool in the coming season. Game possibilities at Fortune Bay Resort Casino include slot machines, blackjack, and poker. An adjoining hotel presents rooms which are equipped with a mini fridge and microwave, plus all the other resort-worthy amenities. Also, a shuttle bus service is provided for hotel guests. Assuming you haven’t blown your food stipend on gaming, you can indulge in one of several restaurants, such as the Sunset Steakhouse, the Tamarack Buffet, the Gold Mine Grill, the North Star Bar, and the Wilderness Grill. And Fortune Bay isn’t just a name, it’s an actual place where this resort’s marina is located, and it accesses Lake Vermilion: 40,000 acres of water for your aquatic pleasure. Wilderness is the name of its acclaimed golf course, and the Northstar Lounge is home to frequent live music shows.